ZOTAC GAMING GeForce RTX 20 Series - Get Fast. Game Strong. Box Dimensions (LxWxH) 16.9 x 11.65 x 4.0"
GAMING GeForce RTX 2080 AMP Graphics Card is rated 4.6 out of 5 by 17. Rated 5 out of 5 by Mohammed from Great 4k performance & excellent fans management As RTX2080, I pass pascals series to get this this one. Since I want to play 60fps 4k or 1440p gaming with HDR on Sony 900F. And like the performance. As for Zotac GPU, the fans are quiet and use only 60% under normal gpu clock boost and get under 75 c in heavy 4k gaming. If you use 100% fans and overclock 60MHZ, you will be under 70c for normal or cheap air cooling pc build. Rated 4 out of 5 by David from Best performance per dollar at premium end of the spectrum Bought this on sale for six hundred and sixty bucks which beat out the falling costs of a used 1080 TI. If this card will fit in your system then you cant beat this price. It doesnt seem any louder than the EVGA 1070 TI SC card that it replaced. But seriously, this is a big card! The RTX technology is absolutely a gimmick at this stage. A few titles that support it only look good at Ultra settings but then framerate drops to the point where you question why you bought a 144 hz monitor. Rated 5 out of 5 by Robert from Great card! Very happy with the Zotac RTX 2080. Card runs quiet, even when at load. Stays cool as well, topping out in the mid 60s even after hours of gaming. Very pleased with this choice. Rated 4 out of 5 by Alison from Awesome GPU, but it’s HUGE! 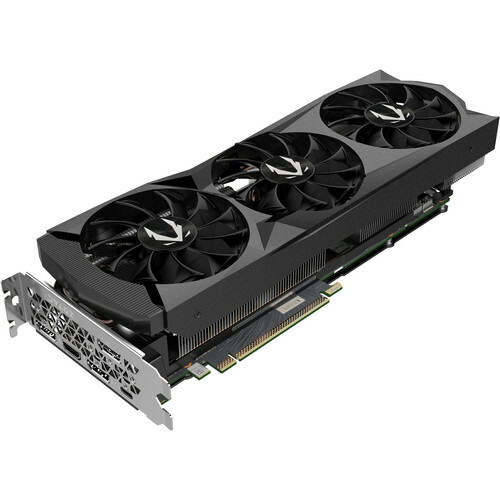 Great gpu! So far, no issues! Only minor complaint is that the gpu is insanely large, so I recommend to consider the amount of space needed to fit the gpu. I have a kid tower - ATX MB, but because it was facing 90 degrees, I could barely fit the gpu with the liquid cooling in the way, so that was a bit annoying. My original NVIDIA 980 FE, had no problems fitting in my pc. Other than that, amazing gpu! Rated 5 out of 5 by Paul from Great Have been playing assassins Creed origins at 2k getting nearly 90 fps and temps around 70 Celsius. Had it for about a month now. Rated 4 out of 5 by Ryan from Hardware is great, software isnt. In regards to the hardware I have had 0 problems and can overclock it to +700Mhz on memory and +80Mhz on gpu clock. With this setting, I get 7700Mhz on memory and boosts anywhere from 2045 to 2075Mhz on gpu during games. It does all this while maintaining a constant 66-67 degrees in my case. However, from the software side I would say Zotac needs a lot of work. Not only is it really difficult to find the right software to download, which is Firestorm 3.0 (I downloaded Firestorm 2.0 accidentally in the beginning because it was so hard to find). Also, I somehow couldnt adjust my RGB lighting on my card until I took advice from online to push the card in further which actually worked, and I was able to then adjust the RGB on the logo. Not to mention, its kind of weird that the RGB functionality isnt really advertised despite it having it (only on the logo), but I guess that was a pleasant surprise to find out. Does this card have a warranty? How do you get all three of the free games this comes with? Metro Exodus, battlefield V, and Anthem. Not sure what the process is to get them. You will usually get a redemption code which you will have to enter in order to download the games. Sometimes it's physically in the package, other times you have to register. My card only came with bfv and it was on a small piece of paper in the box. Does this cad have a warranty? Given there are 4 ports can 4 monitors be run off this card? Yes you can. BUT! the max res is 7680x4320, which is the same # of pixels as four &quot;4k (3840x2160)&quot; monitors. But one of the ports is a is an HDMI 2.0b (which has a data rate of 14 Gbps) while the other three are DisplayPort 1.4 (26 Gbps). So your HDMI port will have limited refresh rate. As a whole I think you might run into limits on the refresh rates. Is the battlefield V game a physical copy or code to activate after purchase?